Yesterday was my 23rd birthday and the Herkimer Diamond I purchased on Ebay 2 weeks ago finally arrived, shipped from the US! I live in Australia. I arranged my usual setup for photographing crystals, and encountered some problems when stacking the final results. I made 3 attempts and the problem was not solved. x2 strobes on left and right, the Herk was set in a DIY diffuser tent. I use Paul C Buff strobes, one is an Einstein E640 and the other is an Alienbees B1600. Same output rating. E640 is simply more advanced. Camera I used was a Nikon D810, with a PC-E Micro-Nikkor 85mm f/2.8D. No tilt'shift was applied though. Camera set on a steady tripod with a steady RRS BH-55 head, so I don't think shake should be an issue. I had to manually press down the shutter because I didn't bother tethering. Tiny movements may have been induced, but Zerene Stacker aligns it all perfectly anyway. It looks okay as it is, but abysmal when zoomed in. The complex texture in the Herk is completely lost. Everything is smudged and blurry. The stack itself is pretty sharp, which is evident when looking at the matrix. I stacked 124 shots which is way too much for a magnification that's not even 1:2, and I thought that was the problem. For my second attempt, I basically selected different parts to focus on and resulted in 8 exposures, I stacked them and the result was pretty horrible. This time, I took around 50 exposures at a different angle. The final image looked really nice but once again, the same problem exists. The texture in the clear quartz is completely gone. I pulled out a weird amethyst cluster I acquired from an auction and used the exact same setup, no problems whatsoever. Some shards are out of focus, indicative of lack of exposures for stacking. Besides that, I see no issues. Hotspots from the studio strobe destroyed the detail, these specular highlights are blown out and no data can be recovered. 2. Stacking problem, when stacking, fine details are stacked on each others, creating smudges and blurs. I personally think it's a combination of #1 and #2, and I should probably try stacking under natural light later today (it's 00:30 here, and I have a 9am lecture... I should go to bed). Anyway, I'm going to stop rambling. Any help, tips, links to tutorials, and recommendations in composition will be greatly appreciated! I'm actually looking to make an automated stacker myself and compare it to manual stacking for my final capstone project in university (doing electrical engineering and maths), so I have a lot to learn! The world of Macro is a world that most people are missing. Macroscophic Solutions on Flickr has a couple photographs of Herkimers, and they look really nice and clear. It looks like only one exposure to me? The Silicon & InP chips I image (some of my designs, I'm an EE) may have similar problems to your crystals. I found with some chips with tiny solder balls which act like spherical mirrors, I needed at least two levels of flash diffusion. I used two light tents, one small inside the other larger one. I also used many strobes (cheap manual types) positioned around the larger light tent, each strobe had a soft box with double diffusion. All this gave a more uniform lighting for the subject and reduced the specular artifacts from the solder balls. I would think on a tripod and hand triggering you have some small vibrations that could smear your results. Sources of vibration that have bothered me are, mirror flop (use mirror up), front shutter (use rear curtain sync), long resonance time (use very stiff camera/lens mounting), floor (use vibration isolation techniques), air flow (move to area with little air movement), AC compressor & pool pump (turn them off), people walking-doors opening/closing-cars-airplanes-TV sounds (usually late at night or very early morning was best). A good, sturdy, vibration isolated bench, goes a long way to help with vibrations. Strobes also help with lower frequency vibrations. How are you focusing - by rail or by lens? I think you're getting hotspots in focus in different places in different images so they can't align. What are your alignment settings? If this is Pmax try Dmap? And as always, diffuse like crazy! Rik will nail it but the extra info may be useful. I think your suggestions are spot on. I can think of some additional possibilities. First, I don't know what your exposure settings are, but at your magnification, camera vibration should not be too much of an issue if the contribution to exposure is almost entirely from the flash duration and not shutter speed. Nevertheless I'd definitely experiment with stacking a few shots with mirror lockup + timer if you don't want to use a remote shutter release. The idea is to reduce this as a possible cause. Next, try a test series with stopping the lens down more, at the expense of diffraction and sensor noise (try not to change the shutter speed). If the individual images don't exhibit the doubling or smearing you're seeing, then you know it's a stacking issue. Conversely, if you are stopped down and you see doubling in single images, you know it's part of the character of the object you're imaging. To my knowledge, quartz doesn't exhibit significant birefringence. 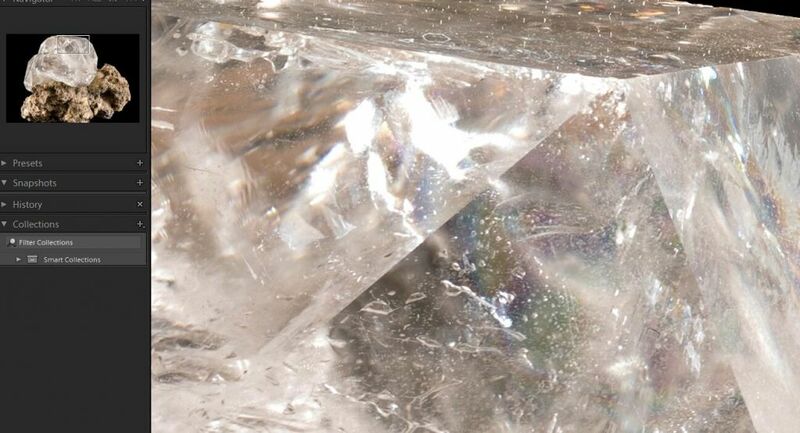 Herkimer diamonds are typically quite clear, but the ghosting could be the result of surface irregularities in the crystal facets, or internal defects. I tried stacking some shots of a rutilated quartz specimen recently (Zerene, using both Pmax and Dmap) and I found the results unsatisfactory: due to the complexity of the relative positions of all the rutile crystals, it was like dealing with the insect hair problem on a much greater scale. To mitigate this, I intend to redo the stack with a higher f-number and change the lighting conditions, although I was quite fond of how I lit it originally. Notably, however, I did not experience the phenomenon you are seeing. Birefringence of Quartz - B has stuck in my head recently so I checked. Yes it is, normal to the C axis but not strongly, 19x less than calcite. Not sure if it would be of help but have you checked out this site. i seem to have seen ref by another author on here, just cannot remember who. call it an age thing? Diffusion! Yes, I should try more diffusion. My strobes were not diffused at all, the only diffusion is that little lighttent. My stacking method is using a rail, which I forgot to mention. The focus ring of the lens is untouched. I use an RRS macro rail. I should have included a photo of my rough setup. The most obvious problem is carpet. I plan on solving this with a diy bench pressed down with heavy objects, maybe bricks or dumbells. I use pmax. I should try out dmap when I get home, really good recommendation! I apologise for not being able to quote and specify the person I am replying to, currently on my phone. I appreciate all the help! Shutter speed was 1/250, mirror-lockup mode, and electronic shutter enabled. Aperture was at f/8. Equivalent to 9-9.5, since it's a macro lens. I went 16 and 22, results were a bit unsatisfactory. I find the optimum to be around f/8. I should try tetherting and other methods mentioned to pinpoint the problem. Thanks for all the help! One other small detail to keep in mind- even if most of the light is coming from flash, any surfaces that make specular reflections could still be reflecting continuous ambient light, and those might be visible in the final image. There is another effect that may be causing your problem. It turns out that under some conditions, certain features of the subject may appear to move sideways as focus is changed, while other features remain in fixed positions or move in other directions. 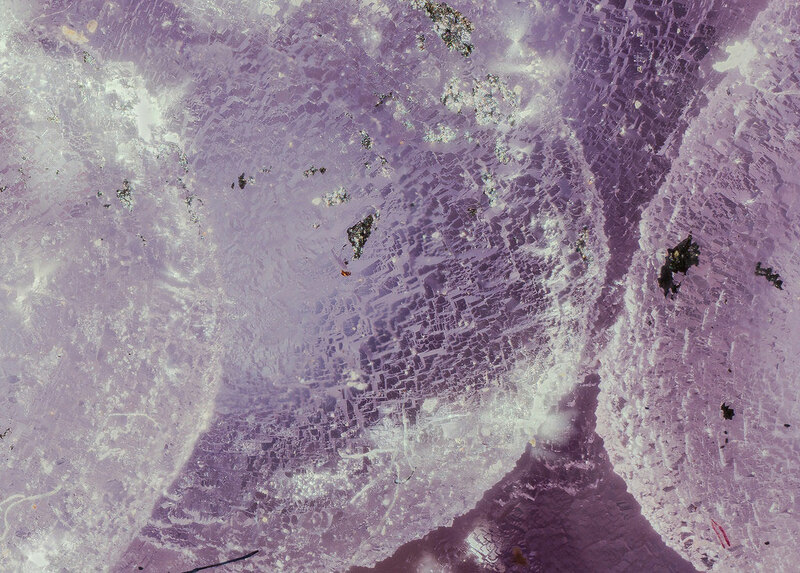 This effect is quite common at high magnification, using wide aperture microscope objectives. But it can also occur at low magnification, and I think it would be particularly likely to occur when features are seen through slanted not-quite-planar faces of refracting material. Before getting into the details of why this can happen and what you might do about it, I suggest to examine your stack more closely and see if you can tell for sure if it's happening. The simplest way to do that is to recreate the problem or reload the saved project that has the problem, then put a checkmark on "Show as aligned" and follow the instructions in the Zerene Stacker FAQ for "How can I detect movement in my stack?" The key thing you'll be looking for is to see that certain features move slightly sideways (including up/down or oblique) while other features move in other directions or not at all. You mentioned that the matrix looked pretty good after stacking, so that might be a good place to confirm features not moving, in the same frames that show other features moving a troublesome amount. Zoomed in to 100%, you should have no trouble seeing movement in any of those places where the PMax stack shows two or more well separated copies of small features. I tried Dmap with my 124 image stack, and the results are actually way better! The texture in the herk can be seen easily. Smudging still exists, but at this point, it's just my carpet. I'm going to get another stack going tomorrow, with various diffusers I have. This time, the rainbow due to... dispersion I guess? Can be clearly seen. The tiny airbubbles are observable as well. Pmax takes detail fom more than one frame, which can lead to more of what you had, whereas Dmap uses the sharpest. Another issue you may have I think, is perspective. I noticed the flikr note said the earlier image was a crop from a corner. When you move the entrance pupil of the lens to focus, the perspective changes for each frame so it's not possible to align all the detail as the view changes. It can be a problem around 1:1. If you have detail at two depths in focus in two images but in two different places, you get dots or a smear. Is your lens "internal" focusing? That holds the entrance pupil still while you focus. Good for tethering. "Is your lens "internal" focusing? That holds the entrance pupil still while you focus." Chris, are you sure about that? If the moving elements are in front of the aperture, then I think the entrance pupil could move as focus is changed. You're right Lou, it's only some lenses. I just peered into a Canon 100mm L macro and the EP (apparent position of the iris) does move. That's the only internally focusing macro lens I have. It makes it a lot easier if you're screwing an objective (or lens) on the front that the lens doesn't physically extend, but that's different. The EP is fairly well back near the body, which helps (but not if trying to avoid vignetting with an objective). It's probably fair to say generally you're better off with an internally focusing lens. The EP moves a lot more than I expected, apparently something about 20-30mm as you go from 1:2 to 1:1. As you focus closer it does go further back, whch is at least the better direction. It would be interesting to know the behaviour of other models of IF Macro lenses. The only lenses that I know off hand don't move their EP, are fixed on Powershots.